I believe this tortilla soup recipe is all of those things. It’s been in the works for quite awhile. A few years, I think. I’m pretty much in love with this particular version. It’s spicy and complex from a mix of fresh and dried chiles, bright and herbal from a short simmer with cilantro stems, and a little tangy from a squeeze of lime to finish it all off. This is a soup I eat to warm up body and soul on gloomy winter days, to clear out my head when I feel the sniffles coming on, and most often to satisfy my craving for the Mexi-Cali food that I miss so much. I hope you enjoy it as much as I do. You’ll notice that I add the cilantro much earlier than you might expect and that I’m using the stems instead of the leaves. Cilantro stems are much sturdier than the leaves and will stand up to a good simmer. Adding them this way allows the cilantro flavor to really permeate the soup. Additionally, this is a spicy soup. To reduce the heat a bit, leave out the chipotle pepper and add a 1/2 teaspoon or more of smoked paprika along with the other spices. You’ll still get the smoky flavor that the chipotle adds but without so much heat. Finally, if you don’t have access to the dried chiles, just leave them out. You’ll lose a little of the complexity but the soup is still delicious with just the serrano and chipotle peppers. Using kitchen shears, cut the ancho and guajillo chiles in half lengthwise so you can open them up and lay them flat. Shake out most of the seeds and discard. Heat a dry skillet over medium-high heat and toast the chiles in the skillet for a few minutes on each side, pressing them down occasionally with a spatula, until the guajillo chile darkens. Remove them from the skillet and set aside. If you are frying your own tortilla strips, pour about 1/4 inch of oil into the skillet (still over medium-high heat). While the oil is heating, cut the tortillas in half and then cut each half into strips approximately 1/2 inch thick. Add the strips to the hot oil and fry for a few minutes, flipping once or twice, until they are golden brown and crunchy. Remove the tortilla strips to a paper towel lined bowl to drain and sprinkle with salt. In a dutch oven or soup pot, heat the olive oil over medium heat. Add the onions and 1/2 tsp salt to the pot and saute until the onions are softened. Add the garlic, serrano chile, and chipotle and cook for another 2 minutes. Add the cumin and coriander, stir to to coat and cook for another minute or so, stirring occasionally, until the spices are fragrant. Pour in the stock and chopped tomatoes. Add the cilantro stems and stir to combine. 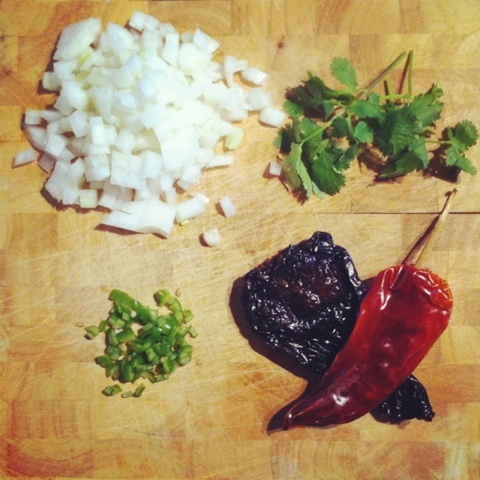 Drop the ancho chile into the soup, cover and bring to a boil. Reduce heat and simmer, partially covered, for about 20 minutes. While the soup is simmering, cut the guajillo chile into 1/4 inch pieces with the kitchen shears. Roughly chop the reserved cilantro leaves. Set both of these aside. Once the soup has finished simmering, take it off of the heat, remove the ancho chile, and add salt to taste. The amount you’ll need will depend on the saltiness of your stock and tomatoes. I use homemade stock and no-sodium tomatoes so I add about 1 1/2 to 2 tsp of salt. Add the salt a little at a time and taste as you go. If the soup tastes flat or bland, it needs more salt. When you have the salt balanced, add the lime juice to your liking. To serve, divide the cheese cubes evenly between your bowls and add a small handful of tortilla strips to each bowl. Ladle the hot soup over the cheese and tortillas. Garnish with the avocado cubes, cilantro leaves, and chile pieces. Good first recipe – looks yummy and is a healthy, light meal 🙂 Looking forward to more. Au match aller, pour la première fois depuis le début des éliminatoires, Valbuena n’était pas titulaire. Une injustice, tant le Marseillais fut l’un des Tricolores les plus réguliers lors de la phase de groupes. Mais un choix qui se justifiait par la méforme du Phocéen. Ce mardi, visiblement, il avait retrouvé toutes ses jambes. Dans un r?le de milieu offensif excentré à droite qui, d’habitude, ne lui convenait guère, Valbuena a mis de c?té ses réticences. Avec intelligence.